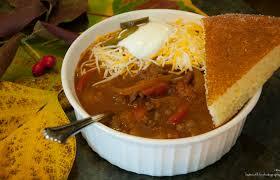 Hearty Moose Chlli Con Carne… an old time family favourite. 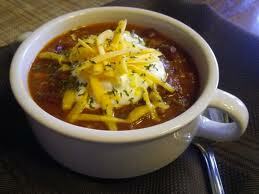 Served with fresh (your choice) Bread, Hearty Moose Chilli Con Carne makes a satisfying meal. An easy to prepare recipe, which can be frozen for latter. This is one of those super easy recipes that a child could make. Assign one of the kids to make this when they get home from school so it will be ready in time for dinner. I will often make a large batch of Moose Chili Con Carne (frozen) to take along when we go moose hunting; just heat and serve. Your hunting partners will appreciate the meal, and it does seem to be somewhat appropriate to be eating moose meat while hunting moose! In a skillet heat Olive oil and cook onion and garlic until soft. One little secret we have found is the first day, or should I say the day you cook the chili, it tends to be a little runny. After refrigeration though it thickens up quite nicely and will serve well on toast. We don’t have moose in Texas but I’m thinking I’ll try this with venison. Looks & sounds great!